MUSEUM 1 was built in the shape of a castle and is reminiscent of a symbolic fortress that protects the timeless value of traditional art. Inside this building, Leeum displays over 120 pieces of carefully selected traditional art on four floors based on theme and time period. The 4th floor has celadon from the Goryeo Dynasty; the 3rd floor houses Buncheong wares and white porcelain from the Joseon Dynasty; the 2nd floor features traditional paintings and calligraphy works; and the 1st floor has Buddhist art and metal works. Furthermore, MUSEUM 1 has provided a communion between artworks under a shared theme called “Beyond Time” by exhibiting selected contemporary artworks alongside traditional works in a harmonious way since the summer of 2014 to celebrate Leeum’s 10th anniversary. Leeum, Samsung Museum of Art, has collected, preserved, exhibited, and researched important Korean artworks from prehistoric times through the Joseon Dynasty (1395-1910). As a result, the museum has built a collection of fine artworks representative of Korea’s long history across diverse fields as well as highly valuable scholarly research materials. Leeum’s traditional art collection includes all genres of Korean art, ranging from ceramics, painting and calligraphy, metal works, and Buddhist art to wood furniture, folk painting, and printed books and manuscripts. 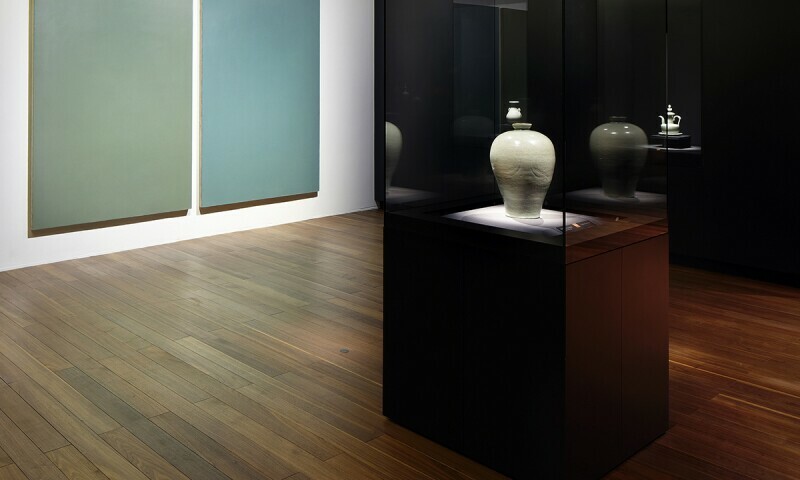 Celadon from the Goryeo Dynasty (937-1392) as well as Buncheong wares and white porcelain from the Joseon Dynasty in the collection demonstrate great achievements made by Korean potters. The painting and calligraphy collection includes masterpieces by leading painters such as Jeong Seon and Gim Hong-do, along with other works that cover various time periods and themes. The Goryeo Buddhist paintings and folk paintings also constitute an integral part of the museum’s robust painting collection. The metal works and Buddhist art add diversity to Leeum’s traditional art collection. The metal ware collection includes pieces representative of each time period in Korean history, from the Bronze Age to the late Joseon Dynasty, while the Buddhist statues and ritual tools illustrate characteristics of Korean sculpture beyond their original function as objects of worship.